Your instant, personal, portable safety zone! 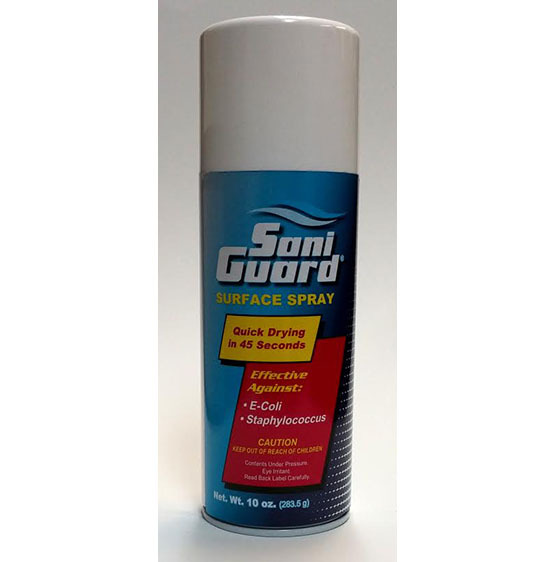 SaniGuard® is an EPA registered and patented sanitizer that kills 99.99% of germs, bacteria, and viruses on contact, establishing a personal safety zone. And best of all, SaniGuard dries on contact, so you don’t have to wait 10 minutes after using SaniGuard like competitive products require. No waiting, no wiping, no mess. Safe for all surfaces, SaniGuard has undergone extensive independent laboratory testing and is the only dry-on-contact sanitizer currently available. Research indicates an alarming increase in the number of serious health hazards caused by germs, bacteria, and viruses. Not only can many of these be transmitted through the air we breathe and the things we touch, the results of the on setting infection are becoming increasingly devastating. One need only look at the worldwide outbreak of the Severe Acute Respiratory Syndrome (SARS), or the Avian Influenza (Bird Flu) which many researchers caution could become a global pandemic to realize the consequences. Yet shocking as this may be, an estimated 1 out of 3 people still do not wash their hands after visiting the restroom, one of the easiest ways to prevent the spread of these infectious diseases. Although you can’t control many of the factors that cause germs to spread, finally you can do something to protect yourself, your family, friends or colleagues and your environment. Any other public/private area where harmful microbes pose an infectious threat.